Although Britain's F3 champion was not assured of a F1 drive, as had seemed the case in the early 1980s, it did guarantee a place in a good team in F3000. The British series, now sponsored by Lucas, continued to add depth with fields averaging 34 cars, up from 28 in 1985, 21 in 1983 and a mere 17 in 1983. 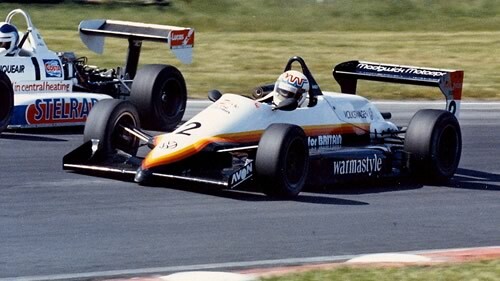 After his disappointment in 1985, Andy Wallace moved to Madgwick but remained faithful to Reynard, one of very few drivers who did. Wallace and Maurizio Sandro Sala, in Eddie Jordan's Ralt, dueled for the title until 'Morris' inexplicably lost faith in the Ralt and Wallace was able to dominate the closing stages of the season. Martin Donnelly was Wallace's closest challenger after Sala faded. Further down the field were a few future stars, notably Damon Hill and Johnny Herbert. Remembering how Ralt had come back so strongly against Reynard in 1985, most teams stuck with Ron Tauranac's cars but there was a move towards Reynard late in the season as Wallace's example qualified on pole 11 times in succession. Nobody tried the Dallara 386 or Martini MK49 which were completely dominant in European national series. Points table from Autosport 4 December 1986 p31. VW strengthened its grip on F3 even further in 1986 but Toyota introduced a new 3S-G engine to replace the ageing 2T-G design. Only Intersport used it in 1986 and it made little impact.